The ways in which human rights defenders are perceived affect their space for work and their security. Stigmatisation is a common method of deterring them, and occurs in different ways – from name-calling, shaming, insinuations, accusations, the spreading of false rumours and lies, to smear campaigns, judicial harassment and criminalization. The negative impacts of stigmatisation can be invisible, subtle, and long-lasting; they can result in more threats and attacks against defenders and the fragmentation of communities and movements. Countering the stigmatisation of human rights defenders is critical to their security and protection, as is the promotion of the legitimacy of their human rights practice. The latest policy brief from the Security of Defenders project is now available. 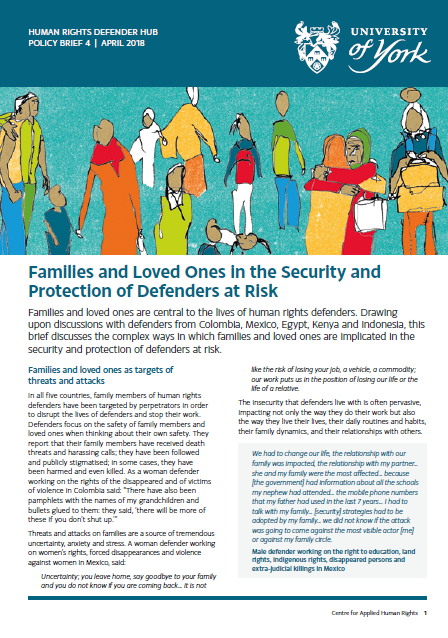 Families and Loved Ones in the Security and Protection of Defenders at Risk discusses the complex ways in which families and loved ones are implicated in the security and protection of defenders at risk. The latest paper in the HRD Hub's working paper series has been published - Defenders Across Borders: Congolese HRDs in Uganda's Refugee Regime. The paper is by Dr Katie McQuaid, an anthropologist currently working as a research fellow at the University of Leeds. Her research focuses on gender and sexuality, violence, climate change, intergenerationality and human rights in urban Uganda. The Hub recently held an exhibition of the work and words of human rights defenders and artists. 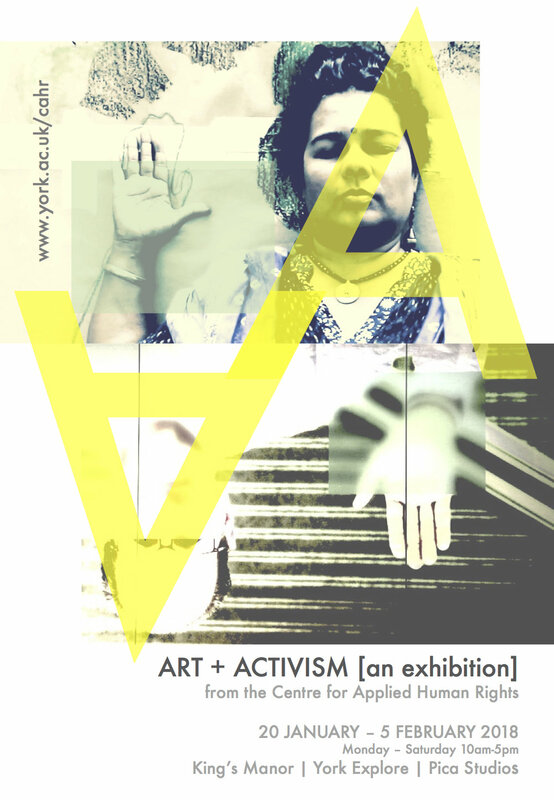 Drawing from the research of the University of York's Centre for Applied Human Rights, this multi-media exhibition of work from international and UK based artists celebrated and acknowledged the work of the political risk takers, rebels and idealists among us. We are happy to share with you our project website (https://securityofdefendersproject.org), through which you will be able to get access to our research findings in English, Arabic, Spanish, Kiswahili and Bahasa Indonesia. The Human Rights Defender Hub at the University of York invites applications to its 2017 Small Grants Scheme. The purpose of the programme is to encourage and enable original research and writing to be undertaken on human rights defenders. A recent collaboration between the Centre for Applied Human Rights at the University of York, Impunity Watch and the Kawakibi Democracy Transition Center (KADEM), produced a policy brief which summarises the recommendations of a number of studies in Tunisia to offer a compact guide to stakeholders seeking to apply the lessons on transitional justice. Alice and Sanna recently visited Uganda and Kenya as part of the Security of Defenders project. Whilst there Alice was able to catch up with former CAHR fellow Gacheke Gachihi (@Gacheke2011) and his colleagues at the Mathare Social Justice Centre. Martin Jones and Sanna Eriksson co-hosted a UN Human Rights Council side event on temporary relocation in Geneva on 1 March 2017. The co-organisers were the Dutch, Georgian, Costa Rican and Swiss permanent missions to the UN, and the Dutch NGO Justice and Peace. The panellists included the UN Special Rapporteur on the situation of HRDs Michel Forst, Mr Kees van Bar the Dutch Human Rights Ambassador, Joe Moses (HRD from Papua New Guinea), Memory Bandera (DefendDefenders), and Alexia Falisse (Justice and Peace). This was followed on 2 March CAHR with a workshop on temporary relocation to build upon our work with the UN special rapporteur on HRDs and CAHR’s extensive experience in running the Protective Fellowship Scheme for HRDs at risk. The day was spent discussing issues affecting temporary relocation programmes, ranging from questions around access to relocation schemes to issues surrounding return after relocation. Participants in the workshop included relocation providers such as ICORN, Justice and Peace, Pan-African Human Rights Defender Network, Forum-Asia and Frontline Defenders. To coincide with the 10th Anniversary of the Centre for Applied Human Rights the next hub workshop will be held in York on 25 & 26 January 2018.